Can you really make money from football betting? Further down this article we will also share further evidence that you really can make money from betting on Football. If you are looking for a ‘one ring to rule them all’ type of system, where once you have found the system you can simply sit back and retire, you are likely to be a disappointed. For starters, having all of your eggs in one basket (system) is a recipe for disaster. Trends and market forces change and you need to be able to adapt and tweak over the years ahead – also no strategy is linear, so it is always better on the wallet (and heart) to have multiple strategies on the go so that you can cover for the inevitable downswing of one system before it corrects again later. This is not to say that you can’t find excitingly profitable systems that deliver many, many units profit per season. They definitely exist because we have seen them – in fact, we know of at least three tipsters who generate all of their selections successfully (and profitably) solely from the Predictology platform, and have done for several years. That said, for all new and prospective members of Predictology we always advise to set lower expectations initially and focus on something we call micro betting systems. 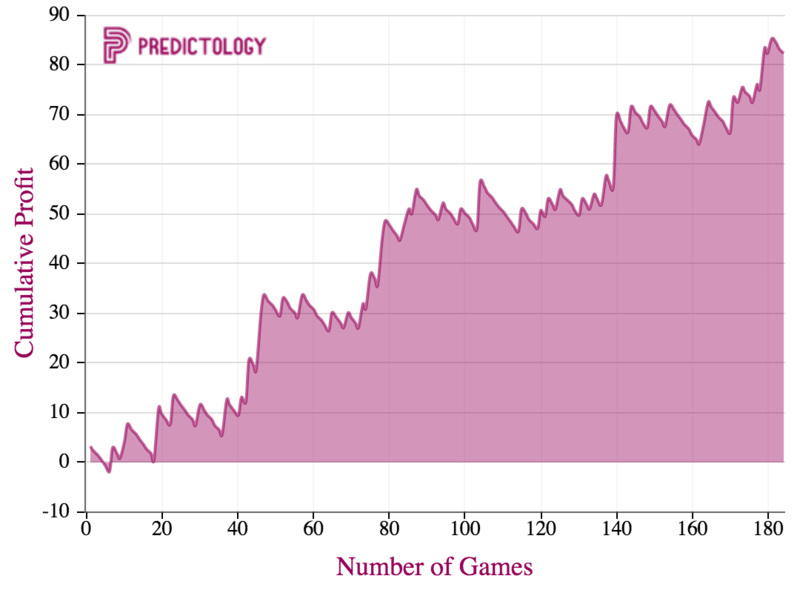 One of the many opportunities provide by the Predictology platform is the ability to develop and create successful micro betting systems (learn more about this concept here). When used correctly and in conjunction with other micro betting strategies, they can prove incredibly powerful…and profitable. 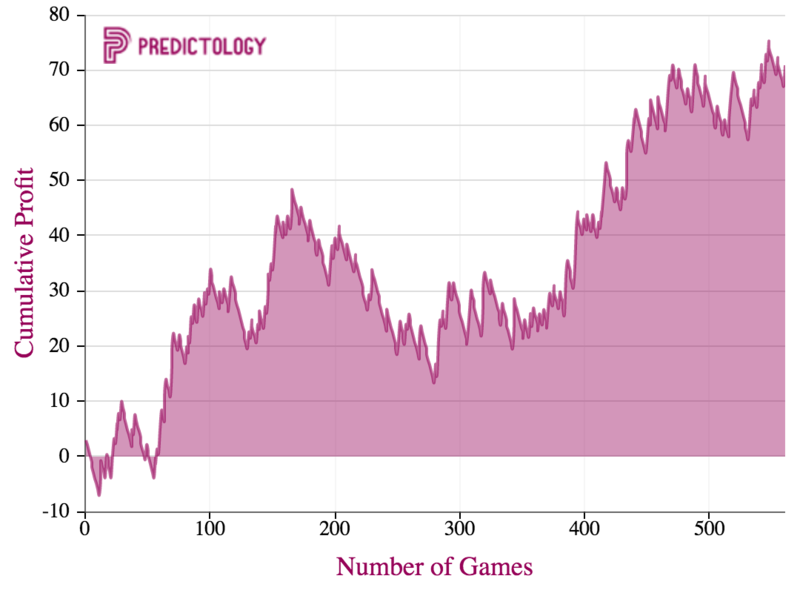 What type of betting systems can I create with Predictology? 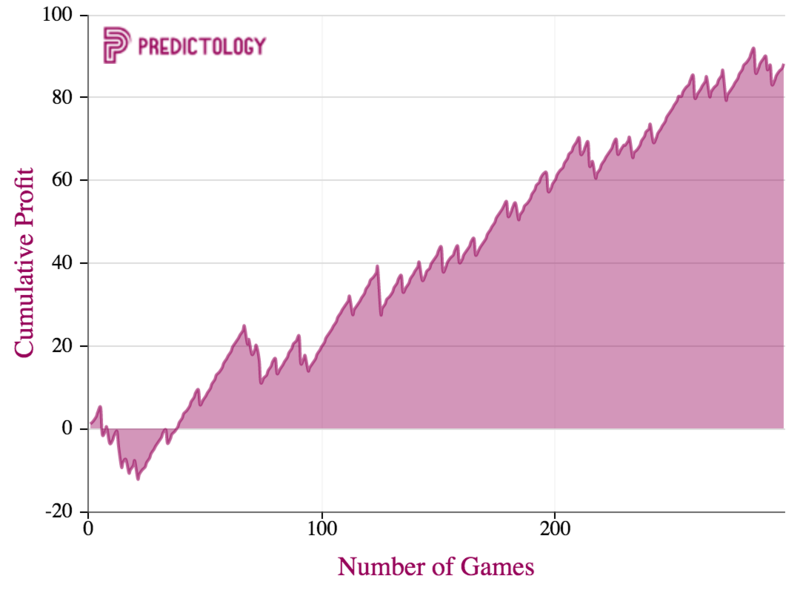 There are two categories of betting strategies that you can develop and discover with Predictology. With this definition, we mean a system that generates a decent volume of bets a season, good profits year in year out and would, by most peoples standards, be called a proven betting system. The strategy below has delivered nearly 90 units profit, at level stakes, over the last four and a half seasons. We can see from the trend lines that profits are relatively smooth and linear, averaging 20+ units a season. 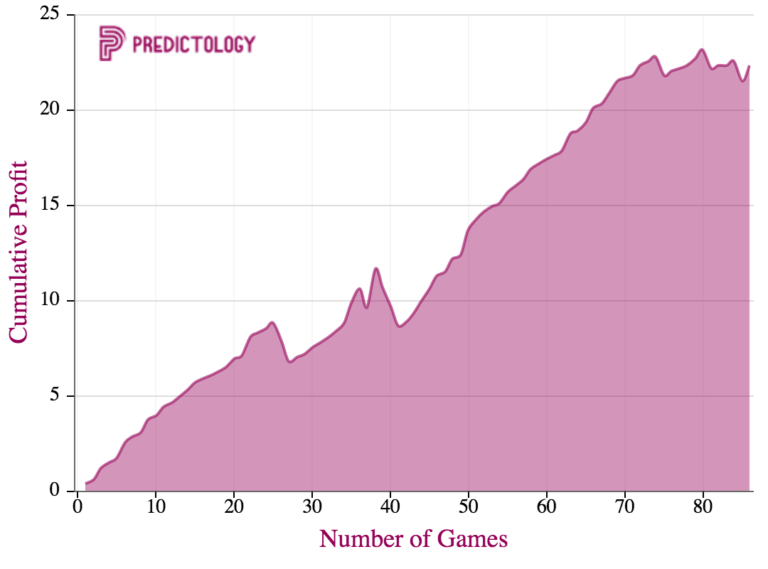 What makes this particular example even more impressive is that it is backing teams to win at high odds (average odds of 7.20), and has a very high ROI of 44.7%. In our next example, we find a system with a high volume of bets but with a strong linear line pointing top right on the chart, which is exactly what we want to see. It gets of to a little shaky start and after that it is pretty much all profit for the next 300 games. In summary, there are almost limitless opportunities for how you can build your own proven football betting system. With Predictology’s custom built server it has never been easier to test an idea and quite literally return results from over 200,000 matches in a matter of seconds. We always advocate take a portfolio approach to your system building and suggest that you try and build a mixture of betting strategies from the two main categories here to build a truly successful and profitable approach to your football betting. This entry was posted in Betting systems, Betting Tips, Micro Betting Strategies and tagged betting tips, betting trends, football betting systems, football data, micro betting angles, micro betting strategies, predictology, proven football betting systems. Bookmark the permalink.